Walk Alongside Me, Daddy Art Print - Personalize with Baby's Prints - Unique DIY First Fathers Day Gift from Baby - New Dad Gift - 3 Colors! Announcement After 12/14 - Please upgrade to Priority Mail for delivery in time for Christmas (within the US). You'll receive a link to download and print the coloring pages so you can use them over and over again. Enjoy! ***Note, you will not receive any coloring pages if you do not add them to your cart before checking out. After 12/14 - Please upgrade to Priority Mail for delivery in time for Christmas (within the US). Faithful Friend Poem Gift from Kitten, Cat, Puppy or Dog to Owner - Personalized with your pet's name & paw prints! Faithful Friend Poem Gift from Puppy, Dog, Kitten or Cat to Owner - Personalized with your pet's name & paw prints! Set #2 of 26 ABC Scripture Bible Verse Memory Flash Cards for Kids! - Instant Download - Printable - Includes 3x5, 4x6, and 5x7 sizes! Back to School Sign. Last First Day of School Sign. Personalized with your Child's name. Digital File or Printed & Shipped. FREE SHIPPING! Back to School Sign. First Day of School Sign. Personalized with your Child's name. Digital File or Printed & Shipped. FREE SHIPPING! Back to School Sign. Floral Watercolor Design. Personalized with your Child's name. Digital File or Printed & Shipped. FREE SHIPPING! Back to School Sign. Floral Watercolor Design. Personalized with your Daughter's name. Digital File or Printed & Shipped. FREE SHIPPING! Back to School Sign. Personalized with your Child's name. Digital File or Printed & Shipped. FREE SHIPPING! Back to School Sports Sign! Personalized with your Child's name! Digital File or Printed & Shipped! FREE SHIPPING! Back to School Sign! Personalized with your Child's name! Digital File or Printed & Shipped! FREE SHIPPING! Boy's Scripture Verse Art Print - Be Strong and Courageous Joshua 1:9 - Baseball Theme - Personalized! Boy's Scripture Verse Art Print - Power and Love 2 Timothy 1:7 - Dinosaur Theme - Green and Orange - Personalize with your child's name! Nautical Boy's Scripture Verse Art Print - Be Strong and Courageous Joshua 1:9 - Select your size! Walk Alongside Me, Daddy - 8x10 & 11x14 DIY Printable File - Personalize with your child's prints! Personalized Watercolor Floral Art Print on Canvas - Nursery Art - Children's Room - Customized with your child's name! 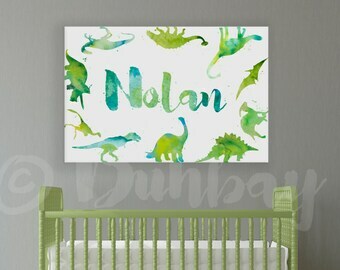 Personalized Watercolor Dinosaur Art Print on Canvas - Nursery Art - Children's Room - Customized with your child's name! Walk Alongside US, Daddy - 11x14 Art Print - INSTANT DOWNLOAD - Father's Day Gift - Three Color Options Included! Great print and done exactly as I requested. Loved the final product. Highly recommend. This is the art print I first designed for Lucy. Her name means "Light" and I wanted this scripture to hang in her room. I designed this one for my son, Nolan. We had been listening to a song with this scripture verse in it, and I loved it! I initially began creating art prints for my own kid's rooms. When my daughter, Lucy, was born, I was searching through Etsy endlessly looking for the perfect art for her nursery. Finally, I decided to make one myself... and I realized that I loved designing art prints! Amanda is a Christian, a wife, and a mother of 3 incredible kids. She lives in North Carolina. She designs, creates, prints, ships & more. This shop is her fourth baby, and she's dedicated to quality products and excellent customer service. Meet Jeanette. She has five grown children, nine grandchildren and loves literature. She lives in New Mexico and is the Editor in Chief at Buhbay. Her keen eye helps this small business run smoothly! Peter lives in the Land of Enchantment, New Mexico. He is a wood craftsman and hand-makes all the wood accessories in this shop. By shopping here, you're supporting local craftsmen like him! Please convo me on Etsy within 5 days of receiving your order if you would like to return any item other than a digital download or customized art. Art that has been CUSTOMIZED OR PERSONALIZED (names, colors, text) cannot be returned. However, if you are not happy with the item you received and I will do my best to work with you. Returns, refunds, and exchanges are handled on a case-by-case basis. If your item arrives damaged in the mail, please email or convo me within 5 days of receiving your order with photos to show damage. Although it is rare, it does sometimes happen, and I will gladly replace items damaged in transit. Personalized digital downloads will be emailed to you from buhbay [!at] gmail.com. Typical processing time (preparing your files for printing, packaging, etc.) is 1-2 weeks. Processing times may be extended if custom color or text upgrades are ordered, or if they fall over a holiday. All art prints are sent via USPS First-Class Mail. *Note: International shipments (outside the US) may be subject to taxes, duties, or other customs fees upon delivery. The recipient is responsible for any such fees at the point of delivery. Art prints are packaged in protective acid-free photo bags and are sent in rigid mailers to avoid creasing in the mail. Canvas art is securely packaged to avoid damage in the mail. I work Monday through Friday, and sometimes on Saturday. However, all references to "business days" refer to Monday-Friday, not including holidays. Please note that every computer screen displays colors differently. Because of this, the printed colors may vary from what you see on your screen. Unfortunately, I cannot give refunds or reprints for colors that come out differently from what you saw on your computer screen. CONVOS: I try to answer convos as quickly as possible, except on Sundays, which I take off. If you've sent me a convo and haven't heard back, feel free to send another! I welcome any comments and questions you may have! Printed art sold in my shop are fine art giclee prints. They are printed on high quality, heavy-weight paper. Digital files will be sent as high-resolution (300dpi) JPEG files. Any digital art print files you receive are for personal use only. You may print them out as many times as you like for yourself, or to give as a gift(s). Digital file(s) may not be distributed, sold, or posted on the internet in any form. Q:: Where should I print my digital art? A:: You can print this digital file right on your home printer on white paper, photo paper, or cardstock. Or, take it to a local copy & print center or send it to a photo print company like Walgreens, Costco, or Shutterfly. The art prints for sale at Buhbay were made by me with a lot of time, effort, and love. Please do not use them inappropriately! They may be used for personal use only. Do not distribute images of my art by email or post them on the internet in any form without written permission. All artwork is copyrighted by Buhbay and may not be copied, reproduced, sold, or used in any form without permission. The "Walk With Me Daddy" poem by Helen Bush is used with express permission from the copyright owner. Thank you to my wonderful husband for his love and support on all my endeavors. Thanks to my three cute kiddos for helping me package and fulfill orders when things get busy. You all are the best helpers ever! A special thanks to Jeanette Horry for being my tireless Editor in Chief! And thanks to www.kevinandamanda.com for the use of some of their fabulous fonts. North Carolina Sales Tax of 6.75% will be charged on all orders sold to a NC State address. How do I get the hand/foot prints on the art? Once you receive your art print in the mail (or once you've printed it if you purchased a digital download), simply use any normal stamp pad to add your child's hand or foot prints. To avoid unwanted smudges, cover the art print with newspaper, except for the spot you'd like the hand or foot to go.